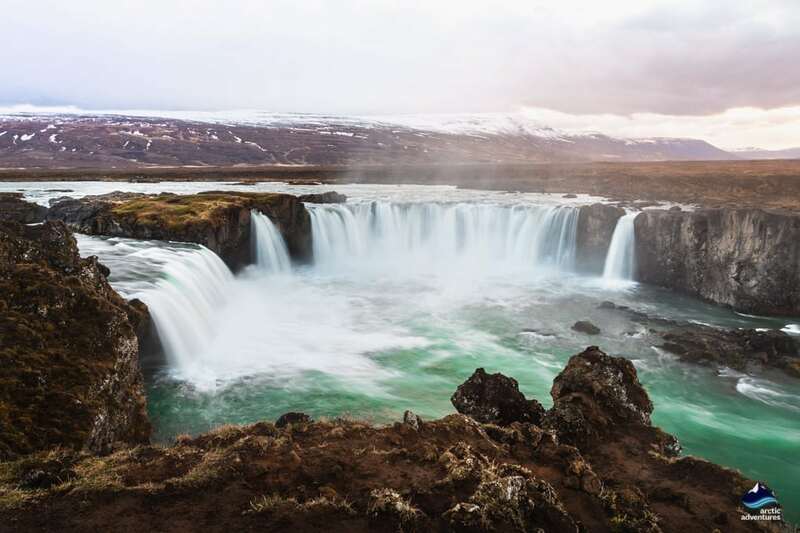 Godafoss waterfall has long been known as one of the most beautiful sights to be seen in Iceland. Located right off the Ring Road no one should let this alluring beauty pass them by without a visit. 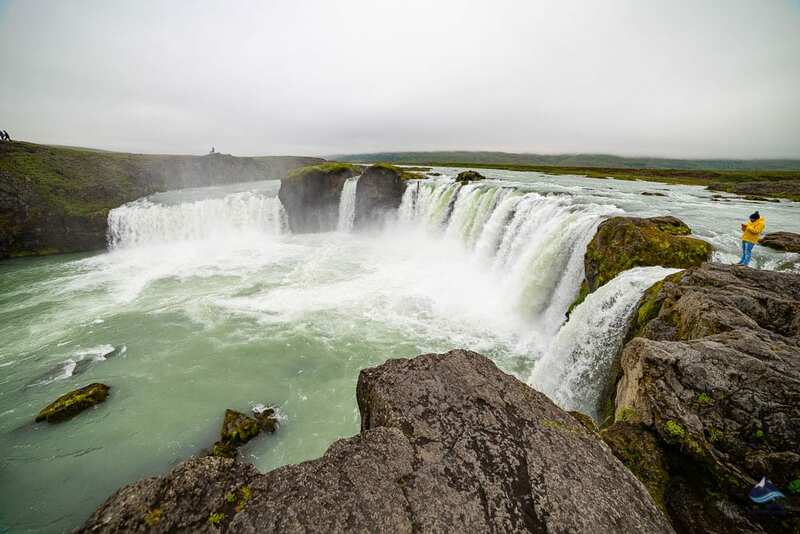 The waterfall, which is often nicknamed the waterfall of the gods takes its godly connection from an old Icelandic saga of a man throwing pagan statues into the falls when Icelanders had decided to convert to Christianity. 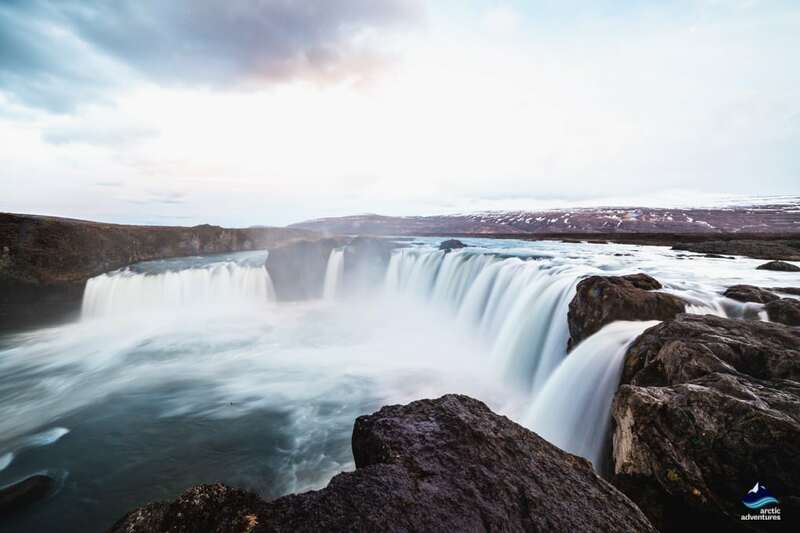 How to get to Goðafoss? 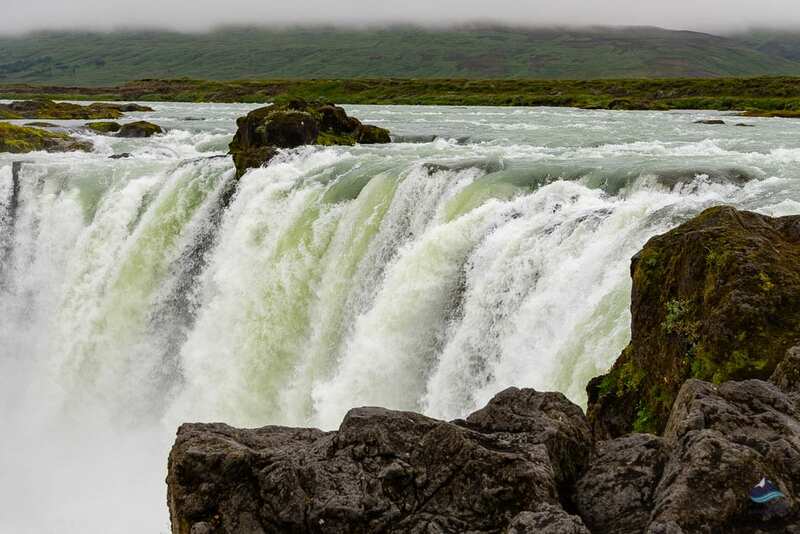 Goðafoss waterfall is often nicknamed the waterfall of the gods. 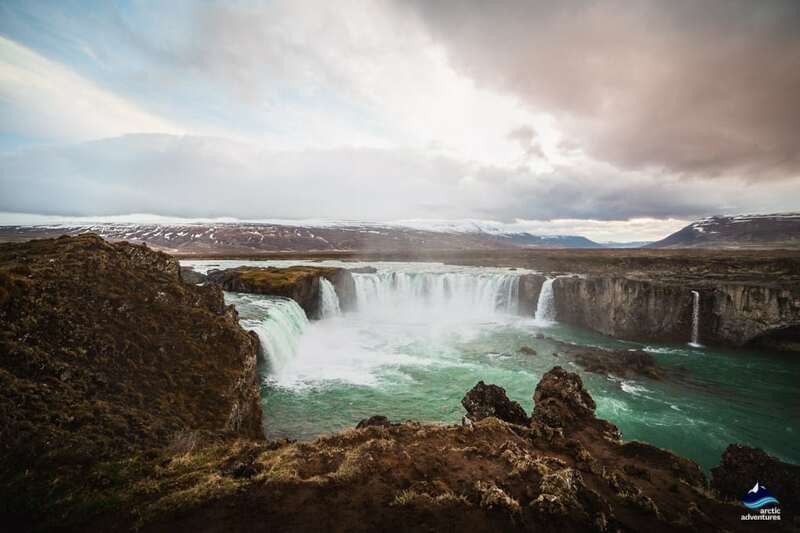 Some believe that the name comes from the fact that the waterfall is godlike in beauty but an old Icelandic legend tells the tale of the waterfall’s name through a Viking leader named Þorgeir Ljósvetningagoði. Þorgeir who was a lay speaker at the old Alþingi parliament is said to have, as a part of his conversion to Christianity, thrown his Pagan statues into the waterfall resulting in the name giving. No one really knows the accurate story of the waterfall’s name but leaving it as a mystery might also play a part in keeping it mythic. 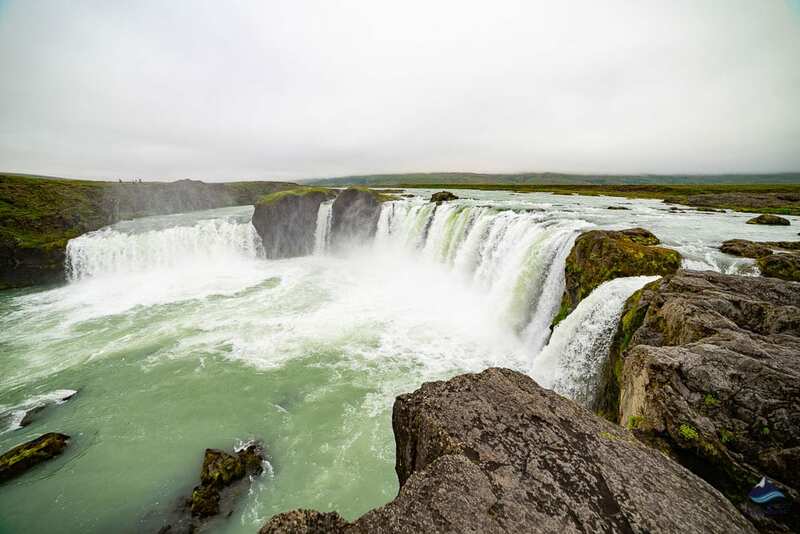 Goðafoss is one of Iceland’s true pearls and one of the biggest waterfalls in Iceland. 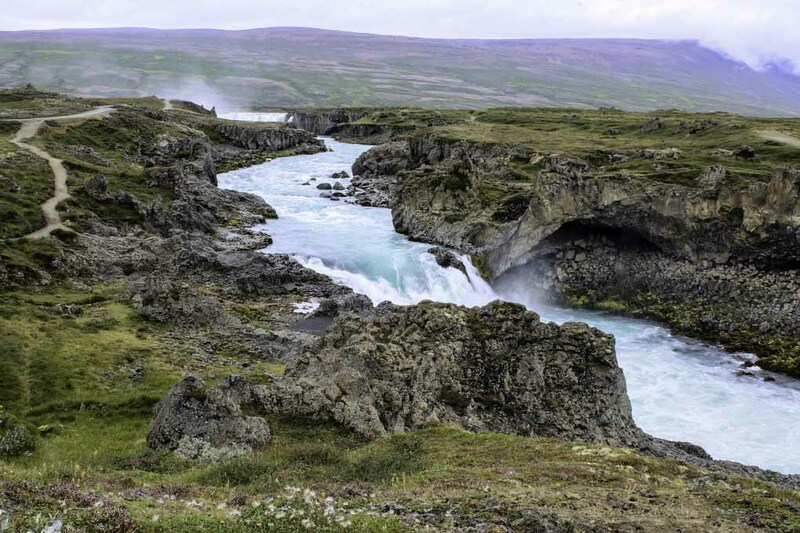 Its fed by the river Skjálfandafljót which runs in a 7000-year-old lava field from the Trölladyngja volcano. 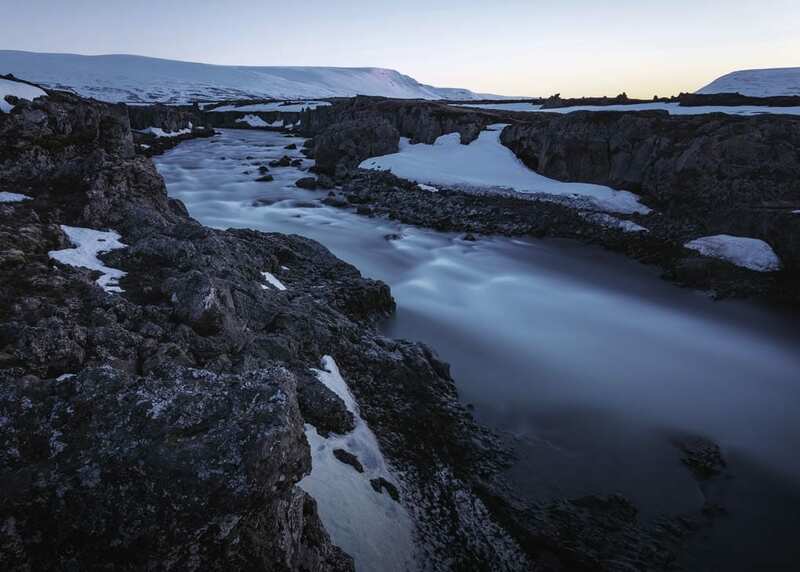 Tröll translates to troll in English so it’s safe to say that the area is nothing if not mystical and has understandably been a real inspiration to many of Iceland’s best folklore tales. The waterfall flows over a 30-meter wide horseshoe-shaped rock that rises in the center separating the waterfall in two. One part is about 9 meters and the second 17 meters high. When the water flow is high in the river other waterfalls often appear in the stream adding even more magic and beauty to the surroundings. 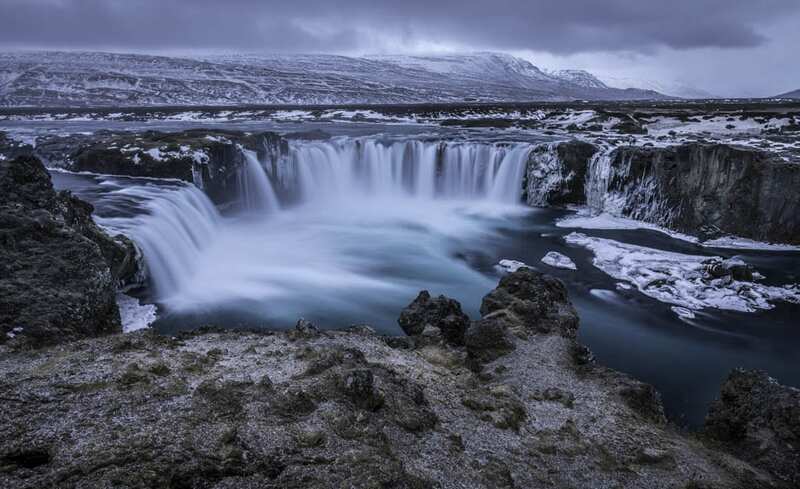 Goðafoss is located in the North East part of Iceland, right off the Ring Road 1. It is 438 kilometers away from Reykjavík, 50 kilometers away from Akureyri and 214 kilometers away from Egilsstaðir. 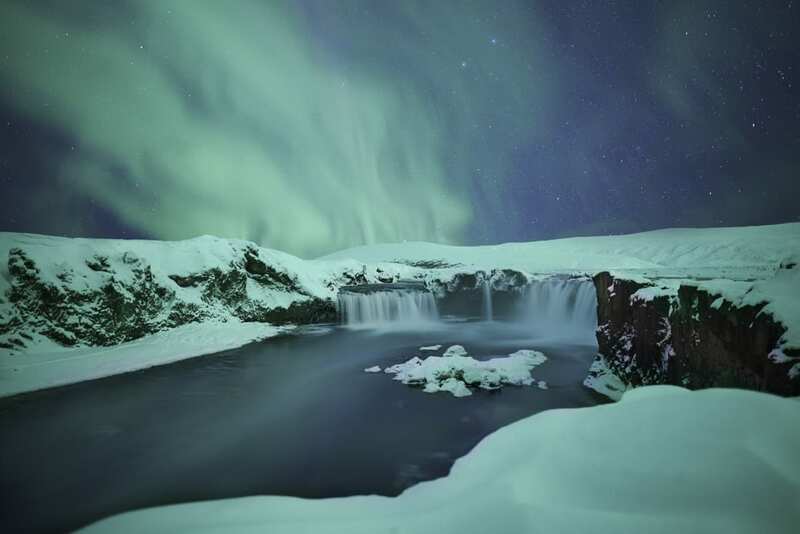 The nearest attraction is Geitafoss waterfall. Goðafoss is very well marked with a big sign and is pretty hard to miss. At Goðafoss you will find a pretty good parking lot situated West of the waterfall. 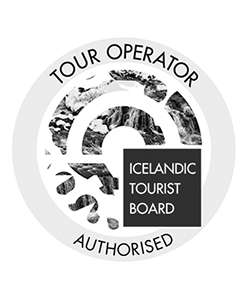 The waterfall is often visited while doing the Ring Road or whilst exploring the North East parts of Iceland. 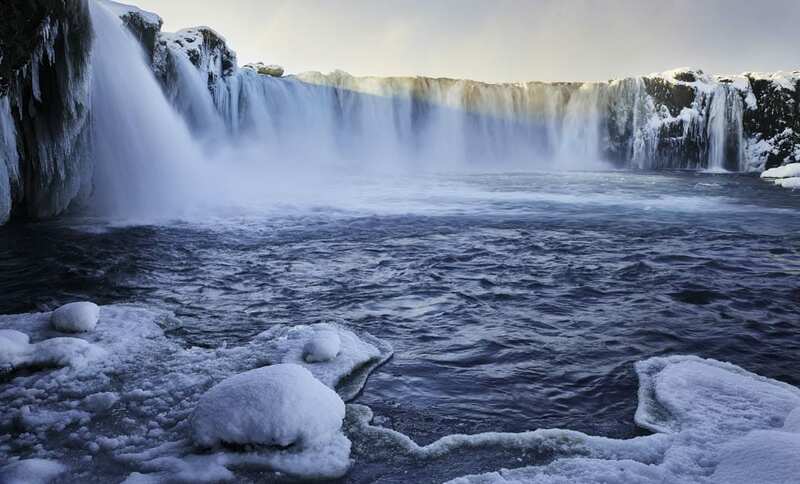 You can visit Goðafoss on Arctic Adventures’ Ring Road tours, or on a 3-Day tour in the North. 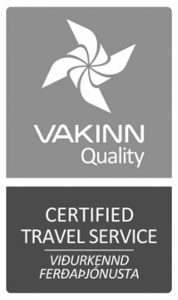 You can get to the North to join the three-day tour by driving or via airplane flying to Akureyri or Húsavík. Driving from Reykjavík to Goðafoss will take you through Mosfellsbær, past mt. Esja and through an underwater tunnel, called Hvalfjarðargöng. 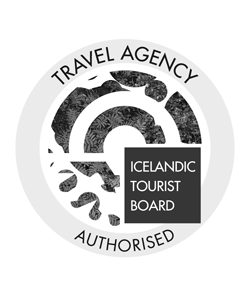 As you continue the road will take you through the beautiful Borgarfjörður and towards Skagafjörður the cradle of the Icelandic horse, through Akureyri and Svalbarðseyri. In about. The drive should take about 5,5 hours with no stops. Still, we wouldn’t recommend doing the drive this way as there is simply far too much to be seen and experienced on the way. Take a couple of days and enjoy the ride. Getting to the waterfall from the West: From the parking lot, you can easily walk down to the waterfall at the riverside. Getting to the waterfall from the East: From the restaurant and the service house at Fosshóll you can walk down a short path and get very close to admire the waterfall. 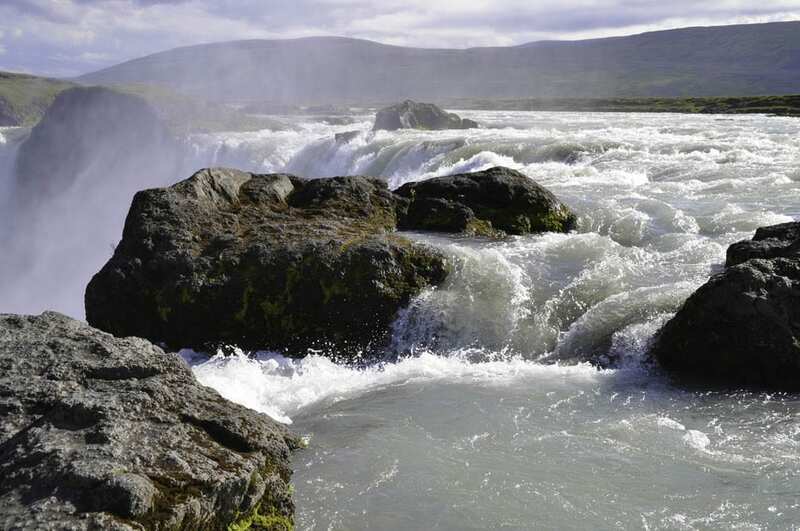 There are plenty of camping grounds scattered around the Goðafoss area. The general price for the night ranges from 1200-2000 ISK, and the facilities vary from simple to extremely well equipped. 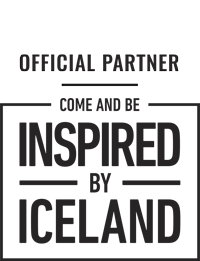 Here reports on the camping sites to help you with the choosing process. The nearest camping ground near Goðafoss waterfall is at Guesthouse Fosshól, only about 500 meters away from the actual waterfall. The camping ground offers basic services including running water, toilets, a gas station, a restaurant, and a grocery store. Open: 15th of May until the 15th of September. Hlíð at Mývatn is located only about 1 kilometers away from the brim of Lake Mývatn. The camping ground offers great facilities including running water, toilets, showers, electricity access, a cooking tent it the weather gets bad, a small shop and a playground. Systragril in the fertile Fnjoskadalur valley and only a short walk away from the forest of Vaglaskógur. The first-class facilities include electricity, a place to cook, heated bathrooms, washers, showers, a golf course, fishing, a swimming pool, and a playground. Open: early June until the 30th of October. Vaglaskógur on inspiration to one of Iceland’s most beloved songs, Vor í Vaglaskógi. Facilities include toilets, running hot and cold water, walking paths, showers, electrify, a golf course and a playground. Open: 1st of June until the 10th of September. Asbyrgi camping ground is a large campsite in a stunning location. The services on site include WIFI, showers, toilets, running water, walking paths, a golf course, a playground, and dogs are allowed. Open: 15th of May until the 30th of September. There is a fantastic restaurant only a few minutes away you can have a good meal with a view over the waterfall! 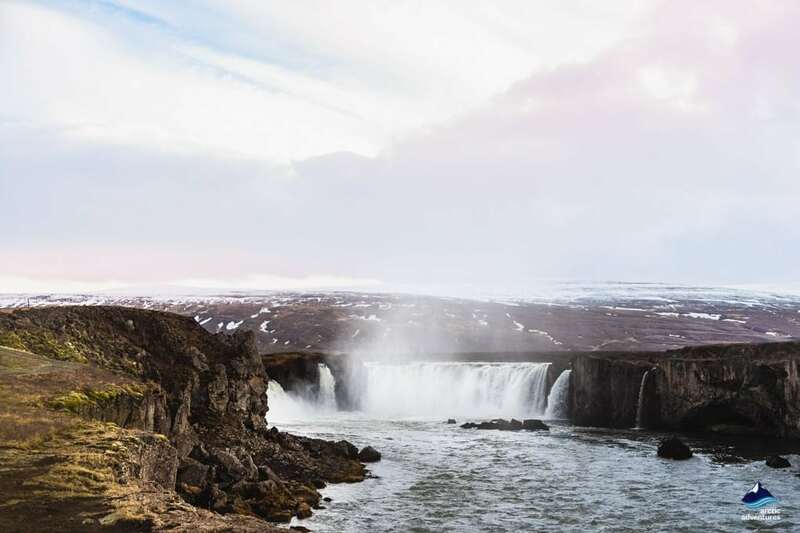 There are so many other places to visit around Goðafoss, check out our Interesting Places near Godafoss below for inspiration. Try to visit the waterfall from both sides, it will give you a whole new perspective of the waterfall. The rocks close to the waterfall can be slippery so be observant of your steps. 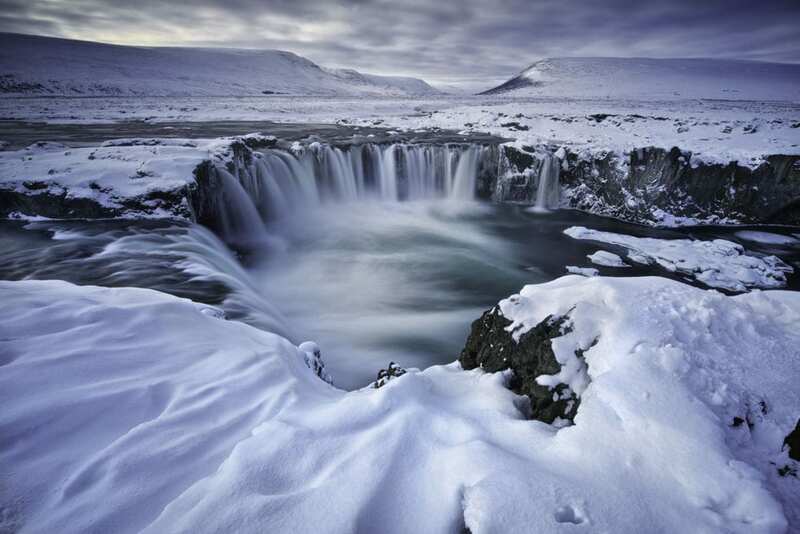 Goðafoss is definitely a great place to visit in winter but getting there can be more challenging than in the summertime. Make sure to check the road conditions if you are planning on a self-drive mission but if you are joining a tour the guides will do that work for you. Dress for cold weather, wear layers and sturdy shoes, preferably with ice grips.